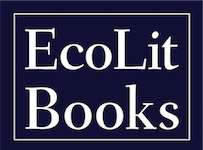 Reviewed by Lucia Hadella in partnership with Oregon State University’s Spring Creek Project and Environmental Arts and Humanities program. How does one go about telling the story of hydraulic fracturing in the United States in a way that illuminates its repercussions for humans and nonhumans? Through poetry? 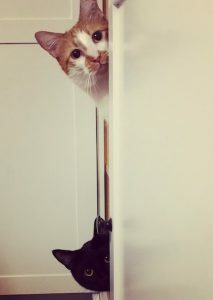 A short story? An essay? Does one travel to a town where fracking is prevalent and talk with its residents, see the operations, walk across the scarred ground? 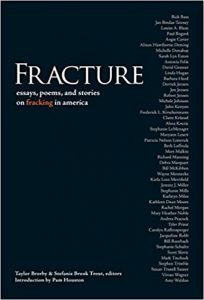 Editors Stefanie Brook Trout and Taylor Brorby made the decision, when putting together Fracture, to include all of these approaches in an effort to capture the qualms and indignations surrounding fracking. I first learned about fracking during my senior year of high school, and I can still remember those infographics depicting the cracks that spread through the shale layer, sometimes more than a mile below the Earth’s surface, branching like a system of roots where trees will never reach. I remember the video of a woman in Pennsylvania turning the knob to her kitchen sink, lighting a match, and flinching as the water ignited with a flash. She talked about methane levels, about getting dizzy in the shower, about the money the gas companies gave her to lease her land for drilling. As an Oregonian who had not witnessed fracking firsthand, my schooling on the subject was important but incomplete. Indeed, one can only learn so much about fracking by watching videos and studying diagrams. A collection like Fracture helps to humanize the on-site damage done by fracking and offer a more complete look at the political and economic forces at play. In order to gain insight for his Fracture contribution “The Occupation,” writer and professor Paul Bogard traveled to southeastern Ohio to better understand how communities there are affected by natural gas extraction. “What I saw in Ohio,” he writes, “is a land under occupation.” Between the “ubiquitous tankers labeled ‘brine’” and the “constant industrial noise, like a factory’s churn and whine,” Bogard quickly determines that the real-life fracking scene is far different from that described by the oil company Halliburton. Like so many other contributors, Bogard’s narrative style entices Fracture readers, and I found myself roped in by the human intrigue of his journalistic approach—and then I remembered that these disturbing stories are real. The threatening industry representatives, the landowners who are duped and coerced, and the ground that “has the look of a recent battle, torn up and scraped bare, all yet to heal” comprise the reality right now in many towns across the nation. It seems appropriate that some authors in Fracture chose fiction as their avenue for exploring a practice whose implications for the future are both significant and unknown. The subject is heavy, and it tugs at the imagination, demanding an explanation and a way to look forward for what actions must be taken. Indeed, some Fracture contributors, such as Moore, take their discussions beyond fracking, seeing the practice as one component of a broader system of resource exploitation in the name of growth, convenience, and progress. In his essay “Insanity,” activist and philosopher Derrick Jensen examines fracking as one part of a dominant culture obsessed with growth at any cost. He reminds readers that “[f]racking is not one lone mistake. It’s not one lone act of greed. It’s part of a larger pattern. It’s one symptom of the disease—the insanity—that is this culture.” He urges readers to fight fracking with this larger picture in mind and to understand that what is needed in taking action against fracking is a systemic shift and not one that views the extractive practice in isolation. Lucia Hadella grew up in Talent, Oregon. She received her B.S. in Natural Resources from Oregon State University, where she is currently earning an M.A. in Environmental Arts and Humanities. Read and share your own thoughts on the Center for Humans and Nature’s Questions for a Resilient Future Series: Does fracking violate human rights?